Veronica Chavez serves San Diego Zoo Global in a consultant capacity as Logistics Coordinator and Administrative Assistant for Cocha Cashu Biological Station. As a Peruvian economist, she has broad experience in administrative and logistical management. Veronica coordinates logistics for all researchers, field courses, and visitors to the station. In addition, Veronica is responsible for purchasing and transporting supplies to meet the needs of the station, coordinating visitor schedules and travel logistics, stocking of general supplies and fuel, and meeting the diverse needs of Cocha Cashu’s many researchers and staff. Veronica also facilitates the vital process of obtaining research permits, working closely with the Peruvian national park service, Servicio Nacional de Areas Naturales Protegidas. 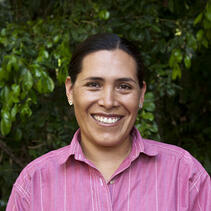 She loves nature and feels personally committed to research and conservation of biodiversity in the Amazon.